Summary: Lila Soto has a master’s degree that’s gathering dust, a work-obsessed husband, two kids, and lots of questions about how exactly she ended up here. I mentioned yesterday that I had a rough December. Like most of you, I was busy preparing for the holidays and I just wasn't able to focus on reading. I didn't get a whole heck of a lot of reading done but I did manage to read a fun book called THE RESTAURANT CRITIC'S WIFE by Elizabeth LaBan. THE RESTAURANT CRITIC'S WIFE tells the story of Lila, a stay-at-home mom who is married to a .... wait for it -- a restaurant critic. Lila was once very successful at her career as a "fixer" for a major hotel chain; however, she has put her career on hold to be a mom to her two children... and a wife to her slightly nutty husband. Lila's husband recently took a job with a Philadelphia newspaper causing the family to move to a new city. It's hard enough to adapt to a new location, but Lila's husband has made it even more challenging by demanding that Lila keep his (and therefore everyone's) identity a secret. He is very serious about not having any ties to anyone in the food industry; unfortunately, Lila's only friend is married to a restaurant owner and she feels torn between her loyalty to her husband and to her friend. Needless to say, Lila's life isn't exactly easy with two small children, virtually no adult contact, and a crazy husband. As a result, she begins to look back fondly on her past boyfriend and her successful career... and actually question her marriage, her mothering abilities, and even herself. Can Lila find her way back to happiness and contentment? I found THE RESTAURANT CRITIC'S WIFE to be a fun read that was just what I needed. For the most part, it was pretty light -- namely because the husband's behavior was so ridiculous; yet the story also had some substance because of Lila's dilemma. As a working mom who moved to a new area to be a stay-at-home mom when my daughter was just two, there were things about this book that I could definitely relate to. to the point of wearing silly costumes to keep his identity a secret. As I read a few of these scenes, I could definitely picture them as a movie! I think what I enjoyed most about THE RESTAURANT CRITIC'S WIFE was what it said about marriage, motherhood, family, and acceptance. All of these things are pretty much universal to all women out there, and I think many will relate (in some way or another) to this story. Despite being a fairly funny novel, the book was actually a little deeper than I expected as Lila tried to keep her family together while also not losing herself. Because there were so many important topics in the novel, I do think it would make a good book club selection... especially for groups consisting of mothers and definitely ones with young children. The author writes with an honestly that all moms will understand, and she touches upon the importance of being a strong mother and wife. In addition, she explores love, marriage, romance, longing, self-identity, and more. 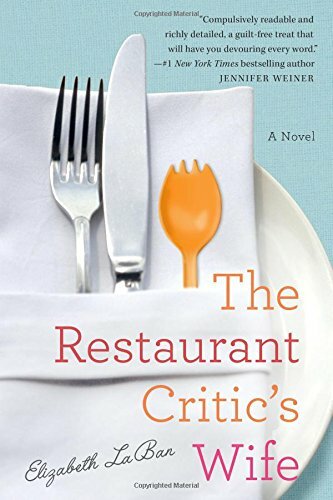 THE RESTAURANT CRITIC'S WIFE is a cute story that will definitely entertain and touch your heart. Recommended to moms of little ones and women everywhere! Thanks to Goldberg McDuffie Communications, Inc. for providing a review copy of this novel. This does sound cute. I have a feeling a lot of moms will be able to relate to Lila. This has been on my list for a number of reasons. Now that I know more about it, I see that it might be a good one to help me get through the winter. Oh! This book sounds really good. I'm marking it down as an option for my Moms Book Club. We're all kindergarten moms, but many of the members have younger kids as well. This sounds like the perfect read for our group. Great review!